Is Pokémon Go the answer to Port Orchard’s road closure doldrums? Hillard posted a photo, showing waterfront park fairly bustling (for Port Orchard) as the dusk settled in. 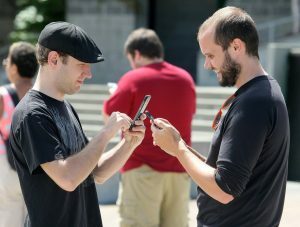 That launched a lengthy conversation thread on Pokémon Go, the recently released, location-based augmented reality game that has reignited the phenomenon of the 20-year-old franchise in Kitsap County — and around the world. This is not Hillard’s photo. It was taken July 12 in Bremerton by Kitsap Sun photographer Larry Steagall. Port Orchard could use a little boost, regardless of the source. The town is experiencing the summer doldrums due to partial closure of Highway 166 (one of two routes into downtown) for most of the summer due to culvert replacement work on Highway 16. We could use an infusion of whatever to bring people out and about, even if it does look like each is off in his own little world. I saw a number of Pokémon chasers as I biked through downtown yesterday. Their presence lent an almost festive atmosphere to the typically sleepy PO vibe. Some people on the Facebook thread joked about players running into fences or other objects. I will say from my observations, Pokémon hunters are intent and most (apparently) not looking where they’re going. Like Donna, I don’t have the app on my phone, so I don’t know if you have a good sense of your surroundings while watching your screen for Pokémon or not. I was somewhat concerned for the folks walking casually on the side of a the road as I pedaled by. Would they suddenly lurch into my front wheel if Pikachu popped up in the middle of the road? Later at a stop light, I crossed paths with a fellow bike rider, who said, “Watch out for those Pokémon players.” As he rode off up Sidney, he speculated aloud that there would be a serious accident or worse before the week is out. I certainly hope not, but seriously, folks, be careful out there. 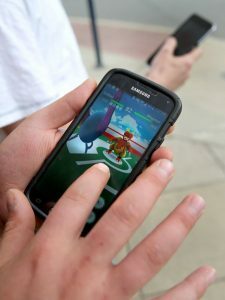 Back to the conversation, Fred Chang, a city councilman who also plays Pokémon Go, suggested a virtual group for players. “Now if they’d just all spend money in the shops on Bay Street….,” lamented Janet Karen. My grandson-in-law, his wife, (my granddaughter), and her mother, (my daughter) were eating pancakes at the Family Pancake House in Port Orchard and his i-Phone popped up with Pokemon stepping on my Swedes (the most wonderful pancakes ever!) Don’t know a thing about this new Pokemon Go but you’re right, Chris. It’s gotta be good if it gets people out and about. If you play, take money or plastic along and shop when you’re out there! Go, Pokeman Go!